Using this book as a guide, you and your favorite budding scientist can have fun exploring the world while you help your child learn about science and develop important science process skills. You may think it's hard to get young children interested in science, but just watch their eyes light up when they make bouncy blubber or play clay, or when you venture out together in the backyard or local park for a bug-collecting expedition. These are the kind of everyday explorations that give kids a great foundation for a lifetime of science learning. 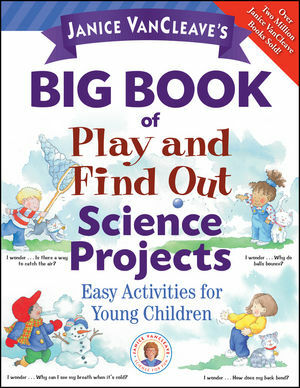 In this terrific collection of fun, kid-tested science activities, bestselling children's science writer and former teacher Janice VanCleave has combined her favorite science activities for young people into one jumbo-sized book that you and your children will love. PHYSICAL SCIENCE: Encourage kids to get physical with science with questions such as: How does a compass work? Why do I have to wear a seat belt? Why can't I catch a rainbow? Why does my hair stick to a comb? NATURE: Help children answer questions naturally including: Why do cats' eyes glow in the dark? How do fish move up and down in the water? Why do plants move toward the sun? Can squirrels really fly? BUGS: Challenge the science bug in kids with questions such as: Why do fireflies light up? How do butterflies drink? Where do spiders come from? Why are walkingsticks hard to find? HUMAN BODY: Capture children's imaginations about the whole body of science with questions like these: Why do I have hair on my body? How does my heart sound? Why do foods taste different? Why are my bones hard? Janice VanCleave is a former science teacher who now spends her time writing and giving science workshops. She is the author of more than fifty children's science books with sales totaling over 2 million copies. A Letter from Janice VanCleave. Spacey I Wonder . . . Is There a Way to Catch the Air? Drifter I Wonder . . . What Holds Up a Parachute? Bouncy Blubber I Wonder . . . Why Do Balls Bounce? Play Clay I Wonder . . . How Could I Make My Own Play Clay? Stickers I Wonder . . . How Do Magnets Hold My Drawings on the Refrigerator? North Seekers I Wonder . . . How Does a Compass Work? Floater I Wonder . . . Why Do Boats Float? Buckle Up I Wonder . . . Why Do I Have to Wear a Seat Belt? Changing I Wonder . . . Why Does My Shadow Change Size? Rainbows I Wonder . . . What Makes a Rainbow? String Telephone I Wonder . . . How Does a Telephone Work? Musical Teeth I Wonder . . . Does My Chewing Sound Loud to Other People? Attractive I Wonder . . . Why Does My Hair Stick to My Comb? Flashlight I Wonder . . . How Does a Flashlight Work? Building Blocks I Wonder . . . What Are Cats Made Of? Stiff I Wonder . . . Do Plants Have Bones? Blending I Wonder . . . Why Are Some Animals Hard to See? Bright Eyes I Wonder . . . Why Do Cats’ Eyes Glow in the Dark? Chill Out I Wonder . . . Why Do Dogs Pant? Overcoats I Wonder . . . How Do Animals Stay Warm in the Winter? Glider I Wonder . . . Can Squirrels Really Fly? Floaters I Wonder . . . How Do Fish Move Up and Down in Water? Sprouters I Wonder . . . Will Seeds from the Kitchen Grow? Sun Seekers I Wonder . . . Do Plants Move Toward the Sun? Juicy I Wonder . . . Why Don’t Cacti Dry Out in the Desert? Browning I Wonder . . . Why Do Peeled Bananas Turn Brown? Scented I Wonder . . . Why Do Some Flowers Smell Nice? Keepers I Wonder . . . How Could I Keep a Flower? Trapper I Wonder . . . How Can I Safely Catch an Insect? Bug House I Wonder . . . How Can I Keep a Cricket? Around I Wonder . . . Where Do Butterflies Come From? Break Out I Wonder . . . How Do Small Grasshoppers Grow Larger? Creepers I Wonder . . . How Many Legs Do Caterpillars Have? Springy I Wonder . . . How Can Fleas Jump So Far? Dancers I Wonder . . . Do Bees Dance? Flashers I Wonder . . . Why Do Fireflies Light Up? Munchers I Wonder . . . Do Insects Have Teeth? Sippers I Wonder . . . How Do Butterflies Drink? Hide-and-Seek I Wonder . . . Why Are Walkingsticks Hard to Find? Top and Bottom I Wonder . . . Why Is the Top of a Butterfly’s Wings a Different Color Than the Bottom? Over the Edge I Wonder . . . Are Spiders Insects? Spiderlings I Wonder . . . Where Do Spiders Come From? Part Four THE HUMAN BODY. Pleated I Wonder . . . Why Are My Elbows Wrinkly? Puckered I Wonder . . . Why Does My Skin Pucker Up When I Take a Long Bath? Hairy I Wonder . . . Why Do I Have Hair on My Body? Curly I Wonder . . . Why Is My Hair Curly? Movable I Wonder . . . How Does My Back Bend? Rubbery I Wonder . . . Why Are My Bones Hard? Plugged I Wonder . . . Why Do I Get Scabs? Lub-Dub I Wonder . . . How Does My Heart Sound? In and Out I Wonder . . . Why Does My Chest Move When I Breathe? Frosty I Wonder . . . Why Can I See My Breath When It’s Cold? Choppers I Wonder . . . Why Do I Have Different-Shaped Teeth? Tube Chute I Wonder . . . Where Does the Food I Eat Go? Big and Little I Wonder . . . Why Do My Eyes Look Red in Some Photos? Tasty I Wonder . . . Why Do Foods Taste Different? Science Project Ideas for Kids Read Janice VanCleave's science blog for more great project ideas.